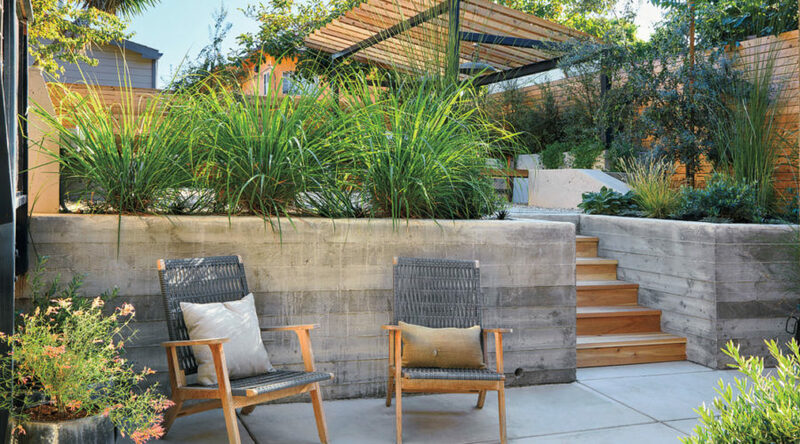 In DuPree’s landscape, that means several seating areas—including one around a Corten steel fire bowl and another by a concrete planter doubling as a coffee table—that call out for relaxation or a gathering of friends and family. Right after the three-month-long project was completed, DuPree hosted a joint 40th-birthday party for herself and a friend with more than 35 guests. They threw open the doors to the yard, encouraging visitors to enjoy drinks under the trellis, snack on appetizers while admiring the olive trees, and chat around the firepit. 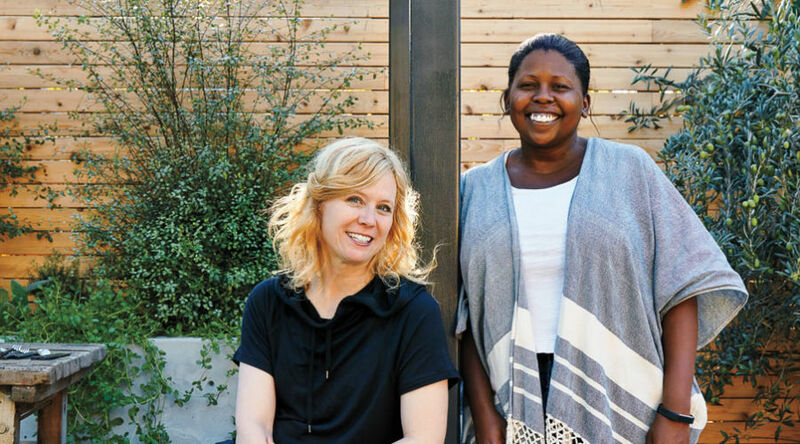 “Almost everyone ended up in the garden,” says DuPree—just as she had originally hoped. Create lines of sight that pique curiosity and encourage wandering to other sections of the garden. 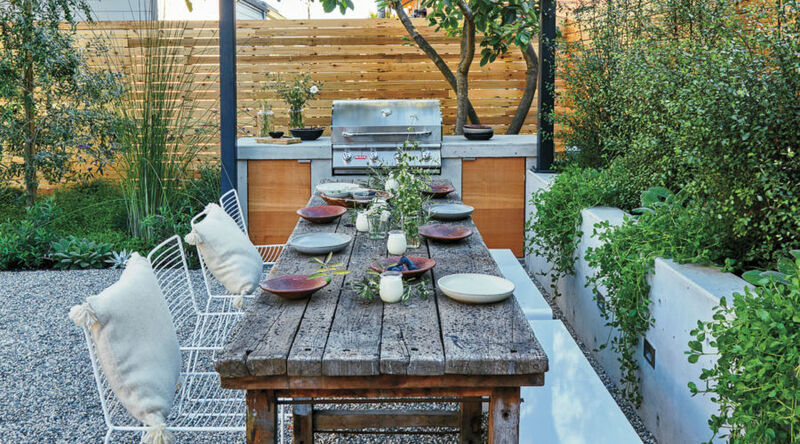 From the seating area, an overhead trellis and a dining table beckon, as do two wooden benches and a sunken patio. 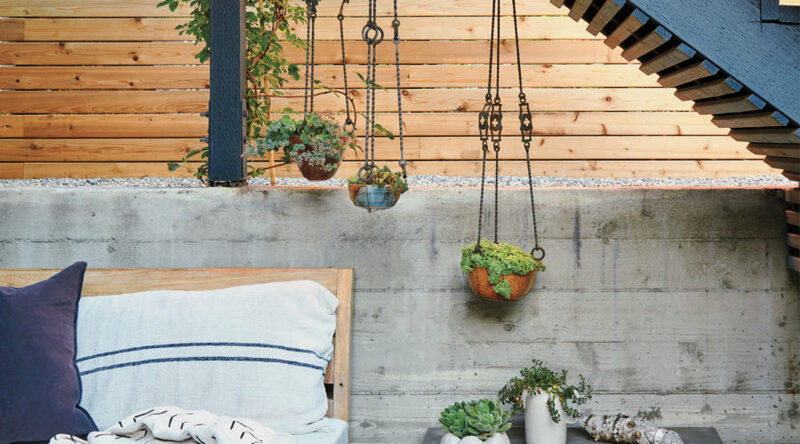 Use gravel light on color to open up a smaller space. “It makes the garden feel larger,” says Mullins. Here, she used a neutral salt-and-pepper rock. a landing pad for some R&R. 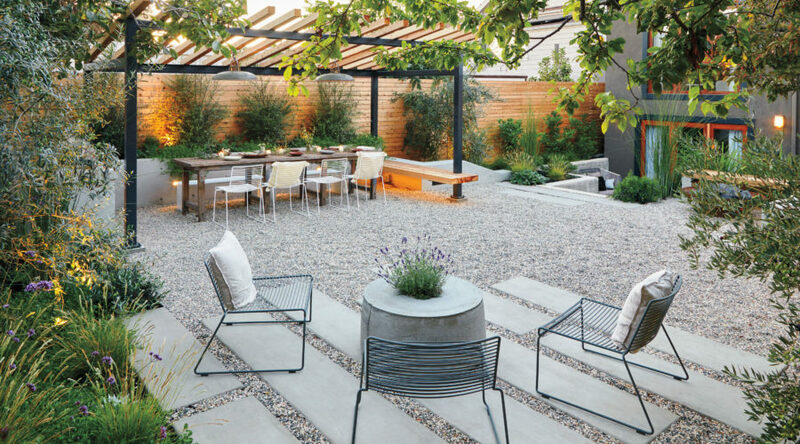 Varying lengths and asymmetrical placement add a sculptural element that breaks up the gravel. Think outside the box--using a gravel sack to shape it, Mullins made a custom, hand-poured concrete planter that doubles as a coffee table. 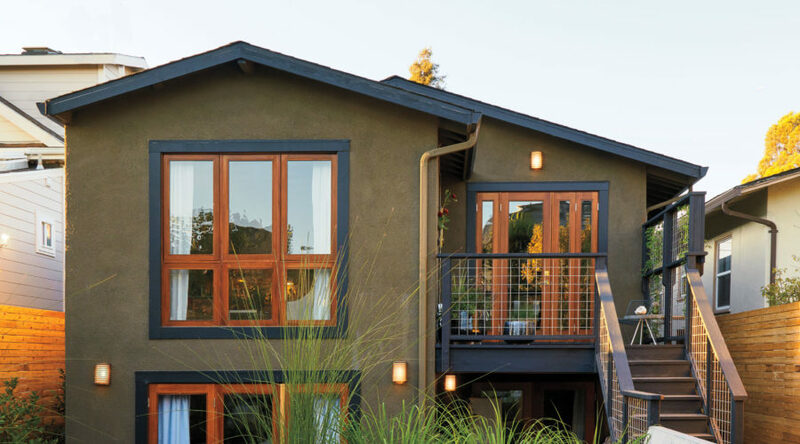 Cedar steps lead to an aromatic seating area with nearby lemongrass and licorice-scented Agastache rupestris—a delicious tea plant with orange blossoms. Mullins recommends a narrow table for outdoor dining, so she brought in this vintage find from the Bay Area’s Elsie Green (). “It keeps things intimate,” she says, plus it makes passing plates easier. CB2’s Victory Pendant Lights ($199; ), rustproof with a light industrial feel, encourage post-dinner chats well into the night. Mullins also installed inconspicuous outlets, so DuPree could work on her laptop without running out of juice. DuPree’s other go-to spot is the concrete bench next to Paloform’s Bol Corten Fire Bowl (from $2,200; ). “It gets good sun, and in the evening it’s a great place to have a glass of wine,” she says. She hosts her ladies’ wine club here and often harvests from the bushy hedge of lemongrass.